Storm damage cleanup happens in Staunton and the rest of Augusta Country a lot – you know the drill: you’re breaking your back trying to clean everything up, break up sticks, saw logs, and even pulling your trash cans to the corner. It doesn’t have to be like that! Staunton gets a lot of storms during all four seasons, and that means a lot of cleaning up. However, we wouldn’t trade living here for the world, and we’re betting you wouldn’t either. Our storm damage cleanup focuses on your trees: fixing up your trees, removing fallen trees and limbs, and helping to fix problem areas. If you have storm damage that you need help with, we will be there to do just that. Even before the storm hits, call us today at (540) 886-5577. Use the form below to request a free estimate on your Storm Damage Cleanup needs in the Staunton, VA area. Much of the damage caused by storms comes to your trees, from lightening damage that can completely ruin your trees to fallen limbs, damage is inevitable sometimes when storms have a lot of ice, high winds, or lightening. For a place like Virginia, even the sturdiest trees don’t stand a chance against the storms. Sometimes your trees are salvageable and you don’t have to put in that much work, however. If you have a certified arborist and a team of people who know what to look for, trees can be remedied. Sometimes storms can leave your yard dangerous, but you might not even know the signs. That is why it is critical to the safety of your home, your family, and your yard that you get people who are fully insured and knowledgeable to help you clean up. Call us today and we can help your yard get back to normal. Contact us today and we will be able to discuss the price of your individual service. In times of a lot of clean up, it is imperative that you call as soon as possible. You really don’t want to gamble with your safety and the safety of your family. Contacting a professional to take care of the problem. 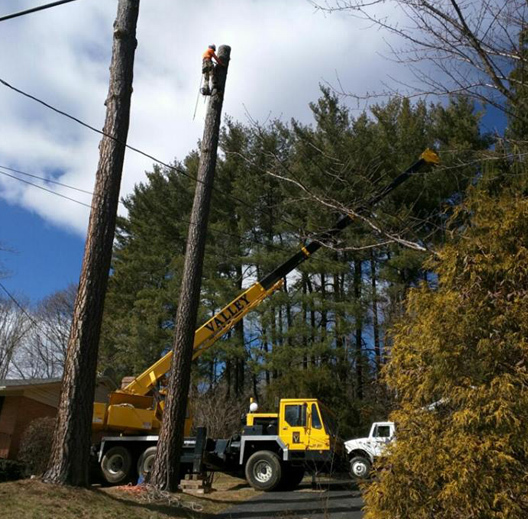 At Staunton Tree Service, we have the equipment and manpower needed to tackle large jobs, small jobs, and anything in between. If a storm hasn’t hit yet, we can do our part before as well by taking your trees and doing a health or risk assessment. Even for new, healthy, strong, and high quality trees, some of the storms we get are enough to knock them down or cause a mess. Call us today to prepare for an impending storm or clean up from one.